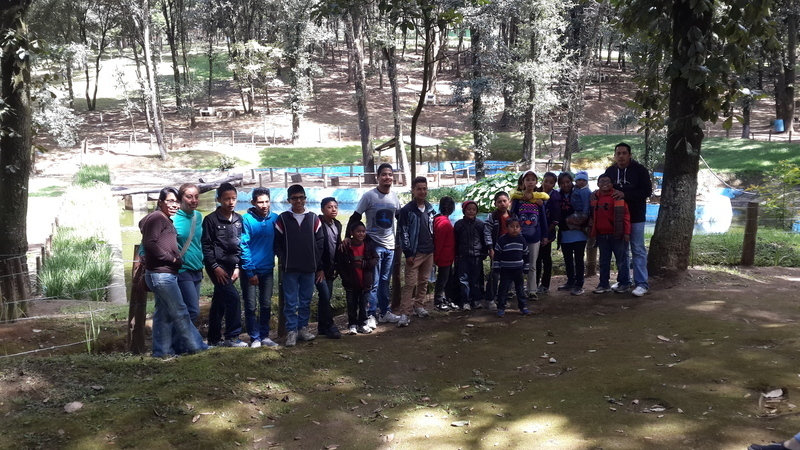 The children of the Rehoboth children’s home in Guatemala enjoyed an excursion to a beautiful forest. The whole family set off on the trip to see the stunning views and have fun together playing games in the park. The children brought along some friends from the community and there was an air of an excitement about the trip. It was an early start and the whole family were up and ready to leave the house at 7:30am, arriving at the forest at 9am where they prepared a small camp fire to cook an outdoor breakfast. Following their tasty breakfast they were fuelled up for the day and bursting with energy. They spent the morning playing and running around in beautiful surroundings. They shared a barbecue for lunch and had a short rest before eagerly getting started on exploring the forest in the afternoon. To top it all off, they finished the day playing with some piñatas, a fun game where the children get to break open a colourful papier-mâché container full of sweets. It was then time to head home. It is important for our families to have a break from the usual daily activities and enjoy spending time with each other. The children exclaimed that it was the most exciting excursion they had ever had. Hannah, age 13, came into our care seven years ago. Her life was turned upside down when Cyclone Nargis hit Burma, tragically killing her mother and paralysing her father. Natinael, age 11, lives in Dembi Dollo in Ethiopia, his story breaks our hearts but thankfully ends in hope. Natinael’s mother was HIV positive and when he was just a young baby, she sadly passed away due to complications from AIDS.